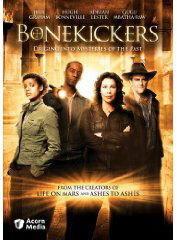 “Bonekickers,” a modern British drama about archaeologists, is being released on DVD on January 26. I did not catch this 2008 program when it aired on PBS this summer but welcomed the chance to watch the six episodes on DVD. The show has a good pedigree. Matthew Graham and Ashley Pharaoh, who created the British version of “Life on Mars” and its sequel “Ashes to Ashes,” created the show. It stars the British household names Hugh Bonneville and Julie Graham. “Bonekickers” is a combination of the British sci-fi drama “Torchwood” and the similarly named “Bones” in that each episode centers around an inadvertent discovery of artifacts, or actual bones in one case. The crack team of archaeologists around whom the show centers are then called in to investigate. Like “Bones,” the characters have histories and personal entanglements that become known during the season. The investigations focus typically more on how the artifacts arrived in an unexpected place, rather than on identifying the items. Examples include a British tank being found buried on a WWI battlefield in France, the bones of slaves from America washing up on a shore in England, and the uncovering of a piece of wood in England that might be part of the cross on which Christ was crucified. Much of the action derives from the villain or opponent du jour wanting the artifact to further his or her own agenda. For example, the discovery of the tank ignites figurative and literal firestorms that involve representatives of the British, French, and German governments. The series also centers around the quest of team leader Gillian Magwilde to find an ancient sword that she believes to be King Arthur’s Excalibur but to also have a much broader history. Each episode provides Magwilde another piece of the puzzle, and the series finale wraps up this storyline in a rather exciting episode that has plenty of good twists. The show is noteworthy for providing brief and interesting history lessons and for explaining the origins of things such as the belief that Friday the 13th is an unlucky day. The stories are also written and acted perfectly fine, but the series is not as compelling as “Mars” or other top-notch British dramas. It seems that the pace could be a little faster and the suspense could be allowed to build a bit more. I also did not get much sense that an important discovery or deduction really excited the team. Further, I did not feel as much of a connection with the characters as I do for the people in series that really grab me. I was disappointed as well that the extras consisted only of behind-the-scenes segments on each episode. I did not watch them but expect that they merely provided a sense of filming each episode. I would have liked to have seen an interview with an archaeologist or a segment on the legend of Excalibur. However, I do still recommend getting this set because its positive aspects outweigh its flaws. As always when my reviews have negative elements, I would love to hear from any fans of “Bonekickers” who can tell me something that I missed about the show. My e-mail is tvdvdguy@gmail.com. Past and present meet with explosive results in this British drama series called "a bit of Doctor Who fantasy, hints of a Da Vinci Code riddle, and even elements of CSI" (The Times, U.K.). Led by the fiery Dr. Gillian Magwilde (Julie Graham, At Home with the Braithwaites), an intrepid team of archaeologists finds mud, blood, and death-defying adventure when they start digging. Set in the beautiful ancient city of Bath, the series blends modern forensics with historical mysteries for exciting entertainment. The top-notch cast includes Hugh Bonneville (Notting Hill, Iris), Adrian Lester (Primary Colors, Hustle), Gugu Mbatha-Raw (Doctor Who), and Michael Maloney (The Forsyte Saga), with guest stars Eamonn Walker (Oz) and Burn Gorman (Torchwood). DVD SPECIAL FEATURES INCLUDE behind-the-scenes segments for each episode.